Human language technologies continue to play an important part in the modern information society. 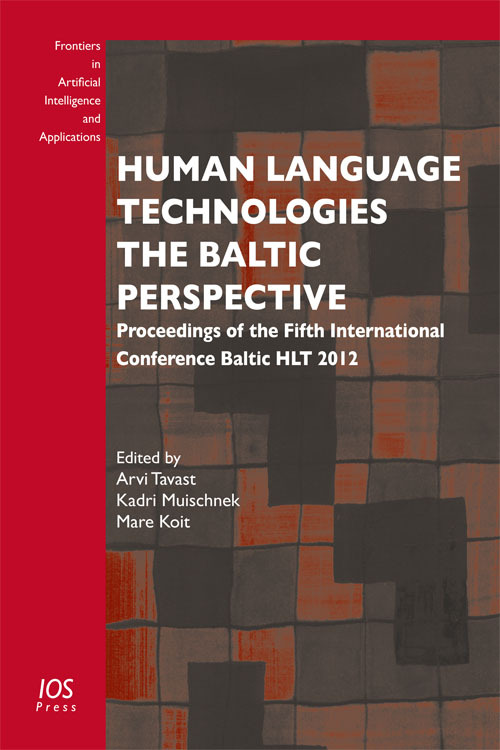 This book contains papers presented at the fifth international conference ‘Human Language Technologies – The Baltic Perspective (Baltic HLT 2012)’, held in Tartu, Estonia, in October 2012. Baltic HLT provides a special venue for new and ongoing work in computational linguistics and related disciplines, both in the Baltic states and in a broader geographical perspective. It brings together scientists, developers, providers and users of HLT, and is a forum for the sharing of new ideas and recent advances in human language processing, promoting cooperation between the research communities of computer science and linguistics from the Baltic countries and the rest of the world. Twenty long papers, as well as the posters or demos accepted for presentation at the conference, are published here. They cover a wide range of topics: morphological disambiguation, dependency syntax and valency, computational semantics, named entities, dialogue modeling, terminology extraction and management, machine translation, corpus and parallel corpus compiling, speech modeling and multimodal communication. Some of the papers also give a general overview of the state of the art of human language technology and language resources in the Baltic states. This book will be of interest to all those whose work involves the use and application of computational linguistics and related disciplines.